He left the hospice with the impression that they are places “where you go to die”. That, coupled with a lack of knowledge about hospice care, was why he did not think of sending his father, Mr Chainchal Singh, to a hospice when the older man had prostate cancer in 2001. As the 52-year-old and his family took on the mantle of caring for the elderly man, he admitted that he did not know many options. His father, then 68, had insisted on living alone in the home he had shared with his late wife, mainly for sentimental reasons. Singh’s mother had died in 2001 at the age of 58 from lymphoma, less than one month after the diagnosis. On the day of her funeral, his father found out that he had cancer. For the next six months, the older Singh lived alone in his three-room flat, an arrangement which caused much anxiety to the family. Singh would then rush to his father’s home, “breaking a lot of traffic rules”, to drive him to hospital. That taxing period of trying to care for his father, who died in 2003 at the age of 70, played a big role in Singh’s decision to become an ambassador for Dover Park Hospice last month. The poor impression of hospices that he had was erased last year after Dover Park Hospice’s chief executive Timothy Liu shared its care and home support services with him. Hospice care is end-of-life care provided by doctors, nurses and social workers in the hospice or during home visits. It includes attending to the patient’s physical and emotional needs, through medical treatment as well as social activities such as outings and festive celebrations. Patients are referred to the hospice by a doctor. The referral takes into account whether a patient prefers to remain at home and the availability of caregivers. At Dover Park Hospice, it costs $325 a day for in-patient stay, before subsidies. The hospice, which is a secular charity, did not provide specific figures on the subsidised fees. Mr Liu said that 90 per cent of patients received different rates of subsidies “according to their family circumstances and income”. However, the hospice’s home palliative care services are free, as the cost is paid for by government funding and charity donations. Patients can be admitted within a few days once they have been assessed by a clinical team and accepted by the hospice. For Singh, the “smartest thing we thought of doing” was to hire a maid to help take care of his father, but that came with its own share of problems. “We had to ensure the maid knew what she was doing,” said the entertainer, who is married with three children. 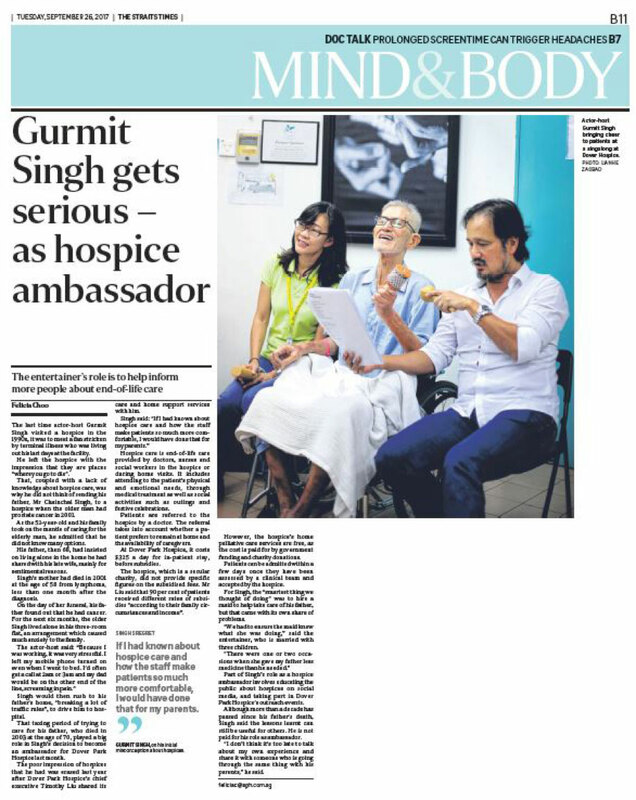 Part of Singh’s role as a hospice ambassador involves educating the public about hospices on social media, and taking part in Dover Park Hospice’s outreach events. Although more than a decade has passed since his father’s death, Singh said the lessons learnt can still be useful for others. He is not paid for his role as ambassador. Hospice care has been available here for decades, but misconceptions and a lack of knowledge still prevent some people from using the service, said Dr Ong Wah Ying, medical director of Dover Park Hospice. Also, healthcare workers in hospitals may not know the right time to refer patients to a hospice. “Hospice care can enhance the quality of life for seriously ill patients and help them find comfort and peace,” she said. In fact, palliative care is being used by more people suffering from end-stage renal, heart and lung diseases, as well as advanced dementia, in addition to cancer patients, she added. Myth: A hospice is a gloomy place and going to one is seen as “giving up”. Fact: Patients can take part in therapy, craft activities and outings. Family and friends are also encouraged to hold gatherings, such as birthday parties and reunion dinners, with their loved ones at the hospice. Myth: A hospice gives little or no treatment to the patient. Fact: At the hospice, the patient is cared for by a clinical team comprising doctors, nurses, medical social workers, therapists and volunteers, who work with specialists from acute hospitals. They help to enhance the patient’s quality of life by keeping him comfortable and managing his symptoms, such as pain and nausea, through medication, therapy and other treatments. Myth: Doctors and nurses in the hospice are not as qualified as those in hospitals. Fact: Doctors and nurses in the hospice are trained in palliative care. Some of them are specialists as well. Myth: Patients cannot leave the hospice after being admitted. Fact: Patients and their family members always have control over their care. Patients can choose to go on home leave or return home after a period of time. Some choose this option in their last few days, so that they can die at home. Myth: Families are “abandoning” their loved ones by putting them in a hospice. Fact: The hospice works with and gives psychosocial support to the family in caring for the patient and helping him or her find closure. For example, the hospice assists families in advanced care planning and supports them after the death of their loved ones. The family can also be with the patient at the hospice at all times.